A handy leaf blower with a vacuum and mulch kit, this Husqvarna gas blower has enough power to clear away a lot of debris. Its 1.1-horsepower motor reaches a maximum power speed of 8,000 rpm while still staying relatively quiet compared to similar models. The cruise control feature is especially welcome, allowing you to maintain a fan speed without constantly adjusting the throttle. The vacuum attachments go on easily and securely and handle small objects fine; some larger leaves and debris may get stuck in the nozzle, however. 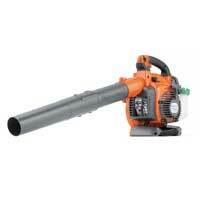 For just $184.99, this leaf blower is easy to maneuver and comes with several useful functions.